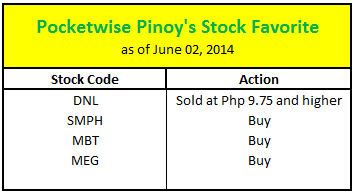 Have you been following our Pocketwise Pinoy (PwP) Stock Favorite table? I have updated the table based on the current actions I am taking. As of today, below are some of the stocks I am investing in and they were summarized in our PwP Stock Favorite Table. I am still buying SMPH, MBT and MEG but for DNL, I sold all my shares. Last May, I sold my shares at Php 9.75. I bought them at Php 7.04. This gave me a profit of 38%. I was hoping it will go up but few weeks after, DNL went down so I waited for the price to go up again. Just this morning, DNL's price opened at Php 9.30 but in a few hours, it went up to Php 9.80 pesos. I was able to sell mine at Php 9.79. Now, I will be reinvesting my funds from selling DNL by buying more stocks of SMPH, MBT and MEG. This is a blessed morning! Have a good day everyone and Happy Investing!